Museo Jumex presents La levadura y el anfitrión (The Yeast and The Host) the first exhibition in Mexico by French artist Philippe Parreno. One of an influential generation of artists emerging in the 1990s, Parreno has pioneered new forms of art through collaboration, participation and choreographed encounters where ‘’the exhibition is conceived as a scripted space, like an automaton producing different temporalities, a rhythm, a journey, a duration.’’ His most ambitious installations have used systems to orchestrate the exhibition. These have included musical notations, weather patterns, and living organisms to trigger sound, video and lighting conditions within the gallery. For Museo Jumex, Parreno presents an expanded proposal over two floors. Combinations of new, existing and re-edited works are overlaid to produce different realities and experiences in an ever-changing composition. At the centre of the exhibition, on the second floor of the museum, is the control centre. Here a bioreactor breeds yeast connected to a computer that remembers the program of a past exhibition (Anywhen, Parreno’s Tate Modern Hyundai Commission 2016 in London). These living colonies are now exposed to a new context and are reacting to it. 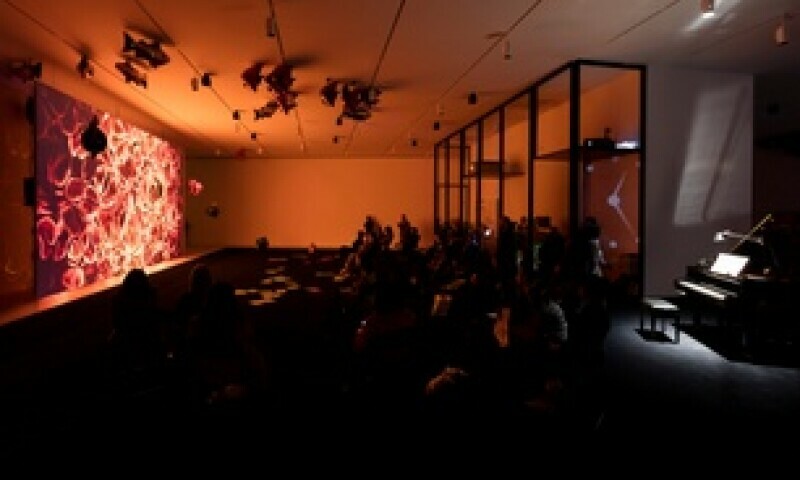 The dynamic systems trigger the order of appearances of events in the gallery space such as the projection of a film or the sound and light movements that reverberate throughout the building. By turning control of the show over to natural systems, Parreno’s work explores the realm between the human mind (el anfitrión) - the host that choreographs the exhibition and other spectral forms of intelligent or emergent matter and activity.